“Where did it end up?” I whisper. His lips are on my cheek now. BOOM! Delilah is pretty sure the Kiss is fiction, despite her head-spinning holiday fling. But with all the sudden crushes, break-ups and melt-downs happening back at home, the Kiss starts looking a little too real for comfort. If only Delilah could keep track of where it’s gone… Who knew one kiss could cause this much trouble? 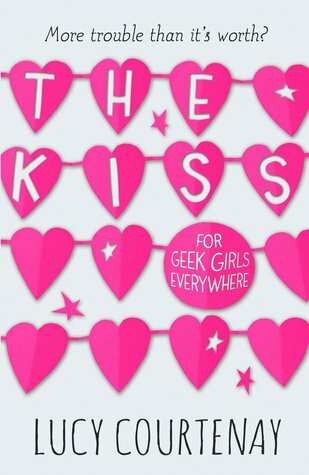 The Kiss is a fun, lighthearted read, although it can be a tad bit confusing at times. It’s full of British humor and lots of drama. We begin with Delilah kissing a cute boy on a moonlit beach in France. When she returns home, Delilah is ready to start college with her best friend, Tabby. Drama ensues when Delilah convinces Tabby she needs to kiss a boy, other than her boyfriend, at a party. Now it’s up to Delilah to fix Tabby and her now ex-boyfriend’s relationship. The plot moves at a very fast pace, and I ended up reading through the book very quickly. The drama is entertaining, and kept me flipping the pages until the end. The book is full of comedy, and I was laughing quite a bit throughout it. I also liked that the characters had flaws and weren’t perfect, which made them somewhat relatable. This book is definitely a teen romance, and I was rooting for Delilah and Jem to get together from the start. They’re cute, and I really liked reading the scenes they had together. Overall, I did like the book. It was an enjoyable, quick, and easy read.